Our stay in Letaba camp was in one of their permanent tents, as we were just staying for one night. These tents are great, not too expensive and serviced by a few ablutions. No utensils provided but there is power and a fridge/freezer. Breaking from the usual evenings cooking we decided to eat at the Letaba camps main restaurant and even though the restaurant is going through management changes (again) we were very pleased with the service and great meal we both had. We would therefore, at the time of writing, recommend the main restaurant at Letaba rest camp if you want a simple coffee, breakfast or a 3 course meal, good food at reasonable prices can be had. 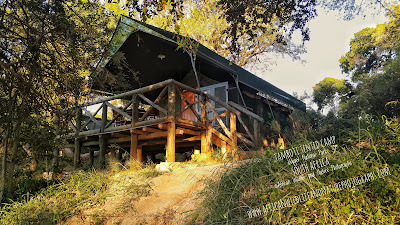 We left Letaba early in the morning and traveled further south as we were due to have our first nights stay at Tamboti tented camp but for various reasons, we ended up staying in a chalet at Orpen Camp, which is just a stones through away from Tamboti. As we had stayed there before we were aware of the ‘resident’ honey badger that does the rounds every night raiding cupboards and dustbins. All cupboard doors and draws have locks on them and when checking-in you are warned not to leave any food out and even to keep your garbage out the bins until the morning. 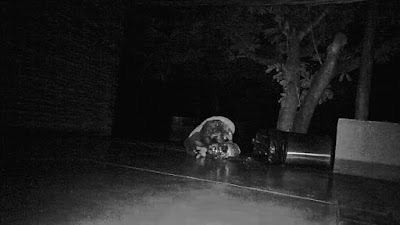 We had only deposited a plastic wrapper, two teabags and an empty 5L bottle of water in our bin but decided to see what would happen so we placed the bin in an area where we could then set up our camera trap. True to form, the honey badger paid a visit. Firstly, it seemed to take off with a tea bag and then at 4am we both woke to a strange noise. Peeking outside with the torch there was said honey badger wrestling with the empty 5L bottle of water. Just gotta love them for their no-care attitude. We heard via friends later that day that people who stayed at Tamboti tented camp had a honey badger raid their cooler box. We were astounded to hear it got away with yogurt, cheese and wine! Seems honey badgers tastes are improving. Glenda was wondering if it was in-fact the same honey badger who then came to visit us, (the camps are close in honey badger terms) and perhaps it needed the water after the wine…..
Outside Orpen camp there is a very nice water hole in front of the camp and the general public can view the Orpen Webcam via the internet. When we arrived there were a few African Elephant (Loxodonta africana) drinking and there was a steady stream of plains game Burchell’s Zebra (Equus burchellii), Impala (Aepyceros melampus),and Blue Wildebeest (Connochaetes taurinus) etc coming through to quench their thirst. We left Orpen in the morning as the following 2 nights / 3 days were spent in Hoedspruit, catching up with old friends and joining our old bird club on their monthly Saturday outing. Great to see many members at the outing and we had a great walk along the Blyde River and being pleasantly surprised by how many species we managed to spot, considering it was mid May. Highlight for a new member was a lifer (first time a bird has been seen by a person) in the form of a male Narina Trogon (Apaloderma narina). Glenda and I were invited to stay with goods friends on the wildlife estate we used to live in (Raptor's View Wildlife Estate) and made the most of being in the bush and placing our camera trap near their birdbath. Great to see overnight visitors of porcupine, Small-spotted Genet (Genetta genetta), Common Duiker (Sylvicapra grimmia) and two duelling male Nyala (Tragelaphus angasii). All to soon it was then time to head back into the Kruger National Park and we managed to finally stay in the permanent tents at Tamboti camp overnight. As with Letaba tents they are very comfortable but a little more secluded, they are located on a dry riverbed and there are only 40 tents in total with a central ablution block and shared kitchen area. 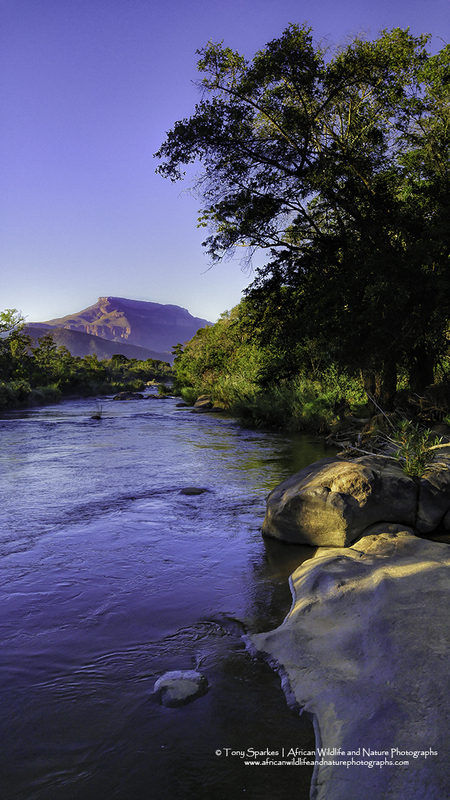 You certainly feel like you are alone in the bush when staying at these ‘bush’ camps. The bush is quite thick around the camping area and we gather in summer it is great for birding. It will be on the list to return to and perhaps spend more time there as we had to make an early start the following day to get to Pretoriuskop Rest Camp. The Kruger Park gets a bit busier when going down to its Southern parts, both with people and animals but we were pleased to finally get to see a pride of 5 Lions (Panthera Leo) on the road between Pretoriuskop and Phabeni gate, especially seeing that we had heard lions roaring most nights. It was a good area for us as we then had two good leopard sightings soon after, one with a kill (Impala) which it had managed to drag up a tree reasonably close to the road. I managed to practice some macro photograph by finding some butterflies close to the camper, follow the link where you can see the results of my macro photography. Again …. Time for a little moan about the camping at Pretoriuskop. The camping site is split into two sections and it has always been reasonably comfortable, but now most of the lower camp and a third of the upper camp have been taken over by a tented concession with their permanent tents. Why, I ask !!! It seems the same number of campers can book at the camp but now there is less space. We eventually found a spot near the fence but it was also close to the ablutions, which meant we had people wandering past us at all hours of the night. We were not happy camper ! After a pleasant stay in the southern part of the Kruger National Park it was time to head back to Johannesburg to stock up and head off for the next part of our travel.